MP Burt said, ““Since the Airport deal was first announced in November 2014, it has been the Opposition’s repeated demands for transparency that have forced the drip-feed release of documents from the reluctant OBA Government. Without these Opposition demands, Bermudians would not have received the limited details disclosed to date. “Minister Bob Richards’ attempt to portray me, the Leader of the Opposition, as declining the offer to view the Project Agreement is not even half the story. The Minister’s offer came with conditions which are wholly unacceptable if we are to be completely transparent. “This is, yet again, another attempt by the OBA Government to drip-feed half-truths, label them transparent, tick the box that they have supplied it to the Leader of the Opposition and then insinuate that I refused the offer for political reasons. That is far from the case. “The public has every right to know the what and the how of this airport privatisation deal which will bind Bermuda for 30-years. But, it goes further than that. It was the Government’s hope that my requests for transparency would go away if the PAC and I had sight of the Project Agreement. “I am not in a position to speak on behalf of the PAC as the Chairman is MP Wayne Furbert, but I can confirm that our Parliamentary Group is unanimous on this point; all MP’s must be provided copies of the Project Agreement and other relevant agreements – not a select few. The OBA offer is not democracy in action. 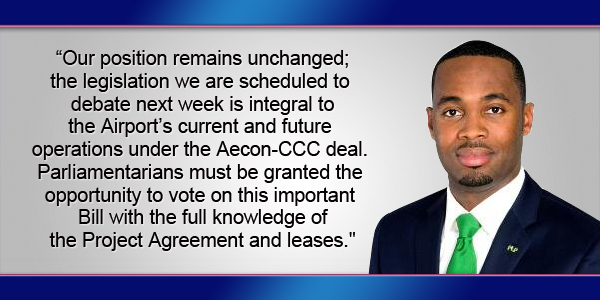 “Our position remains unchanged; the legislation we are scheduled to debate next week is integral to the Airport’s current and future operations under the Aecon-CCC deal. Parliamentarians must be granted the opportunity to vote on this important Bill with the full knowledge of the Project Agreement and leases. “We will do a disservice to the people of this country if we vote on a Bill for which we haven’t seen the Project Agreement. If the PAC had seen the Project Agreement and signed the NDA, we’d have a completely unacceptable and wholly improper situation next week of some MP’s having read the Agreement and some not. “That is not democracy at work. It is anything but transparent. It is unacceptable secrecy and Bermudians should all be concerned that the OBA wants MPs to be silenced about the facts. When can i not see either WBrown or Burt whining about what they want and they aren’t going to have it any other way.Burt is useless as a leader of the opposition we need change someone who will actually fulfill the roll with common sense and forward thinking. The plp are so out of their depth that this all they can do is Quack-Quack-Quack it is time for these guys to go away .. Educate young black man..you can’t take it!! How do you infer that? Burt failed in his duty to conduct the work of the PAC. YOU CANNOT TRUST BURT….many PLP have left because of him , some high profile have publicly slammed him. Educated doesn’t equate to wise, especially with Mr. Burt’s history of misinformation and misrepresentation. His Burt mathematics and the failure of the Ministry of Finance, with Ministerial interference, during his tenure as Junior Minister, doesn’t stand him out well either as an education well spent on. Does Fuzzy ring a bell? I really think they sit around and think “what is the most ridiculous thing we can put in a press release?”. An NDA is completely reasonable, especially for an agreement that has not yet been finalized. However, if I’m the OBA, a signed NDA from the PLP is not worth the paper it is written on. If they think an NDA would prevent the PLP from leaking the terms, they are dumber than I thought. All you fools that got duped into voting OBA now see how much it came back and bit you in de @$$. Now watch how Trump does it on a larger scale. Mr Burt is clearly not experienced enough to understand what a Non Disclosure Agreement means. It is standard in the business world. As Shadow Minister of Finance he is out of his depth and has a lot to learn. This is the people business fool!!!! Burt don’t stop asking questions. Of course he is experienced enough. He was Shadow Finance Minister and is in his mid to late 30s. He is just playing politics. So it’s standard in the business world. It is not standard in the public world. The UK has a well documented policy and procedures manual for dealing with the conflict between a private enterprises’ desire for privacy and the public’s right to know when it comes to PPP projects. Why was this procedure, or many other documented methods, for handling such conflicts not incorporated into the negotiations from the beginning. Bermuda is not the first jurisdiction to face this dilemma. You may fool a few , but the majority of right thinking people know better. Let the voters know what is really going on OBA! With any business agreement made, doesn’t matter who would make it, there will be certain commercial information that cannot be made widely available due to non disclosure. So it goes to say that anyone who wants to see the entire deal would have to sign onto any such NDA to gain access, so for the opposition to reject it because they don’t feel they should have to sign on… hypocrites. After all they made sure we can’t see the full Hospital agreement, and there is more information withheld there than there is currently on this one, and that is already signed. All Burt has to do is sign on, review the full agreement, then report what he can to his MP’s about whether the agreement is a bad one or not for them to be able to debate… oh wait, the information already available has dismissed the misinformation they have been using as their base for rejecting the agreement and now they are just desperately trying to keep moving the goal posts. They also are very quiet about presenting alternatives, maybe becaus their only alternative is a patch and wait approach that would ultimately see the taxpayer pay easily $700m+ for a new airport as we would first have to pay to fix the current one to an acceptable standard that would maybe extend it another 10 years. Or they would have to negotiate a PPP just like this one that would come with the exact same NDA limiting how much information they could share before they signed the contract. Nope, this is politricks pure and simple, the PLP’s favourite game, the game of keeping Bermudians unemployed and disenfranchised with any government that isn’t them. Do You truly believe this airport deal is a Good Deal? Do We truly need such a large and expensive airport? We Could Build it Ourselves!!! Borrowing money for something that generates money is Positive Debt. OBA could have used this opportunity to prove they could command a project with no cost over runs, themselves. This is Not any old Business deal, this is taxpayer dollars and the future of Bermudians at stake here. Please do not down play the NDA. 1. Yes, it’s a fantastic deal compared to all the other alternatives. Note how nobody has proposed anything objectively better. 2. This is the small/cheap version. The PLP’s alternative was twice the cost 10 years ago. 3. We are building it. 4. We’re not borrowing money. 5. The Civil Service run projects, not the OBA. 6. Yes, this will protect the Bermuda taxpayer. Touching on point ’5.’, so why when it comes to PLP it is their fault for cost over runs on projects during their time in government? ’6.’ How will it protect the taxpayer when it is time to hand over the keys and we are in no financial position to upgrade and/or maintain it? ’3.’ We are AECON/CCC now? ’4.’ We may not be borrowing money but We are losing Money as Well as Increasing Expenses. yes, through ministerial interference !!!!!! Re: 5 – The PLP engaged in massive political interference which in many cases lead to the cost overruns. For proof see the various Auditor General reports on PLP projects. 6. Unless we have another reckless government like the one from 2006-2012 we will be in a position to afford to maintain it. 3. They have the experience, appetite, and financing. Nobody else did. 4. All of the alternatives cost us more money. Including simply repairing the old terminal out of pocket because of the debt service cost incurred. Onion is correct. The Civil Service runs projects, except under the PLP the Ministers took over and ran the projects. Jus’ askin… how many people do you know that borrowed money to build a house… then rented the house to pay the mortgage? The only difference between the airport project and building a house is that the renter is paying for construction in lue of the rent. The renter is also getting their monies back plus profit in this case. •All the Monies made from it is Yours. The fastest way to get a Return On Investment. If we financed it, it would not be feasible. The costs of financing of Bermuda govt vs Canadian govt not even in the same ballpark. Even if we financed it, we would still pay back the money spent, plus interest to any lender. This is the same thing, except where you use the word ‘profit’, replace with ‘interest’. And again, we are no where near a position to finance this ourselves, especially with the inevitable huge cost overruns a project like this would incur if we took it on ourselves. Such an undertaking would dangerously expose government’s ability to finance other services, like education and social services. - No, there could be a better deal, but we are not going to be any position for a long time to get a better deal, so given what we have to deal with, this is the probably one of the best deals we can make. - No we can’t. There is no one on island with anywhere the experience to build, project manage and integrate the complexities of an airport construction. We also have no where near the financial buffering to be able to pay for this. - Positive debt is a oxymoron, it doesn’t exist, especially not with the PLP’s patch and repair plan. Even for us to borrow and build new, we would be liable for the huge and inevitable cost overruns that would still mean that all future revenues of the airport would still be going to pay a lender back with interest. - No they couldn’t, they know this, they aren’t ego driven to try and prove themselves, they are smart enough to know our limitations. There is no one in government that could successfully project manage a construction like this, where as AECON has decades of experience. The OBA knows that if government tries to do it, there will be overruns, and with something so complex, those overruns would be huge. - no this is not any old business deal, this is something completely new. It has even been described by overseas experts as innovative to the very real problem we face. And out of any option presented to date, it offers the greatest protection to our future, both infrastructure and financial. - Where have I played down the NDA, an NDA is a critical piece to any and all commercial contracts. It protects all parties’ committed investment to date. No commercial entity would enter into any such partnership agreement and construction contract without one to protect what their investment in finance and expertise, no matter who is negotiating with whom. - We are, that is what the construction contract is for. It sets out exactly what is to be delivered, when and for how much. And we elect governments to make those collective decisions, because the sort of micromanagement of ‘know/pick what they play’ simply renders any institution, government or commercial, unviable. - There is already more than enough information available to the general public to lay low all the oppositions misinformation and misrepresentations, so at this point all they are left with is politricks games. but Burt doesn’t want to see the deal….so on with the peoples business and lets get Bermudians back to work…build this airport once and for all. Let the voting public really know what is going on OBA! Mr. Burt or any member of the PLP, please show examples of projects that you were involved in where the there was transparcy and full disclosure. Don’t talk of what others should be doing if you never once did the same. How open were the details of the contracts regarding KEHM, TCD, Bda Emissions, Port Royal, Dockyard Peir, Berkeley, Quigars, Grand Atlatic, Southlands, Ferryboat purchase contracts, the numerous SDOs that were approved under your watch. just go away with your hate filled rants…. Blurting again. You know, don’t you, that the bills before the House are not for/against vote. You know that. One bill provides for the establishment of a Bermuda Airport Authority, comprised of Bermudian professionals and responsible to Government, to oversee airport operations. The second bill exempts the project’s operating company from specific taxes and charges for a period that allows for upgrades, maintenance and operation of the old terminal building and related airport functions; and, the creation and eventual operation and maintenance of the new terminal building and related airport functions. You know all of this…but keep Blurting and back peddling. Paradise Reclaimed….lol sorry, the name caught my attention.. reclaimed from who? Wonder why your against privatisation all of a sudden. I am curious cant figure it out. What could they be hiding that they don’t want the public to know? If some one can give me an example of something that the public should not know about a project like this please let me know. You do realize a nondisclosure is an agreement that doesn’t allow you to talk about the documemt or idea outside of those that have signed the agreement,right? It’s not a document that leaves out info and states certain info only. The report has the full details pertaining to maybe a trade secret only aecon uses and doesn’t want anyone knowing what it is so they protect ppl spreading the idea with…..a nondisclosure agreement. You just don’t get it do you. It is standard practice in any business contract or legal proceeding. Just Askin – When you have nothing else, you always have to go there with the slavery or race card thing. SAD but I guess it is all you were taught to do when you have nothing constructive to offer. Is slavery is so troubling to you (and it should be) what are you doing to combat it TODAY! Nothing, because sadly, and in a strange way you benefit from it. While slavery is illegal everythere it exists everywhere especially in Africa. I’ve never used the ‘ slavery or race card’ before, EVER!!! But now you’re equating slavery with non disclosure agreements. Really ridiculous comment, if you think about it. It wasn’t, that’s why slavery was abolished. Again, I not down playing the NDA, I playing it up. It wouldn’t matter who is involved in the negotiations, there would still be a NDA in place to cover commercial interests, whether it was the OBA, the PLP or you, there would still be a NDA limiting what information could be widely distributed. To the OBA’s credit, they have released more information about this project and its various mechanisms than any other entity has before, in fact you can find out more about this project now than you can about the Hospital PPP, and that has already been signed and is in effect. “They” are not “hiding” anything. Government is negotiating terms for the project and the counterparty will require confidentiality to protect their considerable investment in legwork to reach this stage of negotiations. The counterparty takes a risk and spends money to carry a concept forward in the hopes of striking a deal, and naturally don’t want to lay bare the data and information they’ve paid for before an agreement is reached. Look at the list of organizations consulted on the structure of this project without objection. Look at the unprecedented efforts at transparency for an agreement not yet finalized. Look at the vast amount of information already in the public domain. Look at who just refused the opportunity for the full disclosure that they’ve being wailing on about for years now. Ask yourself why they would do that. One of the sides may disclose to the other side trade secrets as part of the deal, on the basis the other side keeps it confidential. Or may disclose its detailed internal financial arrangements, on the basis the other side keeps it confidential. The terms of a deal themselves are worked on carefully, and a corporation would not want its competitors to know the ins and outs of how it structures its contracts; that itself is a trade secret. So all large contracts have NDA’s. That is why you have never seen the actual contract for the KEMH wing the PLP had built. We know it exists, and we know we can’t see it because they cannot disclose it. What I find interesting is the fact that Mr. Burt claims that after meeting with his caucus, the offer was denied. Then we have Mr. Burt’s fellow PLP MP and his hand picked successor as PAC Chairperson, Mr. Furbert, claimed to not be aware of said offer. He even claimed the Minister of Finance was lying. I am no politician, but I would assume Mr. Furbert is part of the PLP caucus who denied the Minister’s offer. So why wasn’t he made aware especially as he is the current PAC Chairperson? Wayne thought they were talking about something else. Is Wayne Furbert now the Shadow Finance Minister? That is who becomes the Chairman of the PAC. Wayne Furbert as Finance Minister under a PLP government? You cannot be serious. So Wayne can’t keep up with the conversation. Not surprising is it, given how ridiculous Burt is being. More saber ratling by Burt. He is starting to sound more and more like Donald Trump. You just can’t take private stuff and and something that is not final and throw it out on the street. Enjoy whats left of 2017 folks. How can we trust a person who votes against equality ? , another one of the shameful 20 can’t wait until he knocks on my door . Enough is enough already. Stop blaming the short Cummings of the plp on the Governing party. You guys failed miserably. True Progress is being made, to slowly fix the errors. Refusing to look at it is not good governance Burt. Burt you are pathetic. What a let down you are. Everyone seems more inclined to attacking Mr. but personally rather then listen to what he saying. Give the Agreement for all Parliamentarians to see. You can’t take a test without first reading the book. Like our parliamentarians can’t vote on something if they are not given the information on which to vote. That is not transparency, it is trickery. Here, you can review the contract now – days before we discuss in Parliament. It’s been online for ages. Burt and his MPs must be the only ones who don’t know that. You’d have to be from the movie Dumb and Dumber to not have picked up on the planned gathering set for Feb 3rd. I have heard whisperings for weeks. Burt couldn’t let them down now. This is not about the airport. The airport just happens to be the issue to latch on to. The airport has its critics as with any major project, but support is not split down party lines and is very broad from my islandwide engagement. Burt has missed that point, he is now appealing, for the most part, to the fringe elements within his party, which will likely make themselves known again on Feb 3rd. The only reason he refused because he ant got a club about any of that. an infantile analogy when compared to big business – the bank would allow it if the husband or wife didn’t sign for the loan!! Burt does not know what he is doing, the Oba has slowly improved the country, will take another 4 years to make it even better, plp while in power only put Bermuda in the red every single year in power , at least the Oba is moving Bermuda forward , the PLp should dis mental all involved and start over . Plp supporter here but don’t like what they are doing, let the Oba due there business as they are the government and if you don’t like what they are doing then vote against them. I know who I’m voting for. I do not recall all the hoo-hah over the (new) Acute Care Wing- albeit this was a PPP arrangement and of course the PLP were the Government when that project came into being. However the true cost of the ACW to the Public has never been disclosed but with interest payments over the 29 years of the repayment period amounting to $838m – does seem chicken feed compared to the proposed new airport Terminal costs. A suggestion Burt. Sign the frikin NDA. Read the contract. Express your concerns to the government in private. That way, you might actually be doing something USEFUL. Are part if his concerns that no one is allowed to tell anyone about any of it??? Kinda defeats the purpose a bit… Don’t get me wrong, I’m for the airport, but this NDA garbage is an embarrassing attempt to feign transparency. I’m not sure how good a debate the PLP will present but at least give them the information. That way, whether they are intelligent or not they certainly can’t claim they were not informed. You should have looked at it even if you couldn’t disclose what you had seen you could still continue with your campaign of misinformation. Wayne could have had a peak also that would have been safe. You are angry because the OBA informed people of the offer and refusal I don’t get it. The PLP and Peoples Campaine are out in force with all the ‘likes’ on certain posts about Burt. Tell me this ain’t planned……. Never seen so many likes and dislikes 1 vote apart and such high numbers since viewing Bernews. - we deserve better politicians: OBA get your heads out of your @$$es and start communicating with all of Bermuda not just your base and communication is about finding the right ways, language, styles and methods of reaching your audience rather than just spouting out messages and hoping they are received (e.g. North Hamilton probably doesn’t care at all about your ‘Blue Ribbon Panel’ because said panel hasn’t engaged with them). PLP – where do i begin? Start by showing some genuine concern for Bermuda and show that your desire for political gain is secondary and the votes will follow. You need to expand your base to include potentially the black middle class that wants financial security for their families and isn’t motivated to vote PLP solely as a result of your racial rhetoric. Please please please start presenting yourselves as a VIABLE alternative (this may require a wholesale change in personnel!). For example isn’t of saying “OBAubp is bad and OBAubp are the devil and they only care about their kind and blah blah blah”. Try saying while we agree with ABC that the OBA’s policy is trying to address we believe a better way to address it is by doing XYZ and here are the pros of our alternative and here are the cons and we believe the pros outweigh the cons. Wishful thinking on my part but it is what Bermuda needs and deserves. in a deck of cards i think you would have to be the joker. Truth is, nothing short of scrapping the entire project will be satisfactory. Until then everything will be “unsatisfactory”. If it wasn’t evident before now, surely is now. Just break ground and get on with it. Maybe they’ll block access to the causeway and prevent Bermudian workers from earning a wage. Now that would get very interesting. Your drum beat is that the Gvt are not fulfilling its promise of jobs. You say regularly in the media that our current economic stagnation is causing many families hardship. This is true and the causes are quite evident even if it’s an inconvenient truth for many. Surely getting Bermudians back to work is more important than your political agenda isn’t it? I am not certain how you all can look at yourselves in the mirror each morning knowing you are putting your party and it’s somewhat outdated doctrine ahead of the very people you say you serve. Let’s build this airport and get deserving Bermudians back to work. If you don’t have anything positive to contribute, please just step aide and let this country begin to recover. We have bigger problems on our horizon then the never ending petty squabble of self interest.